August 19 was a day of Celebration when, Odisha has set precedents regarding community rights in terms of involving the local population in developmental activities. In a huge blow to Vedanta Resources Plc's in Odisha, all the gram sabhas have voted against its Rs 50,000-crore aluminium refinery project in the Niyamgiri hills of Odisha . They rejected the mining project saying it would affect their livelihoods and religious sentiments, The voting exercise was conducted as per the Supreme Court directions and the results will impact the Ministry of Environment and Forests final report. The result of the voting, which will have a bearing on the final report of the Ministry of Environment and Forest (MoEF) is likely to jeopardise the investment of Vedanta's alumina refining project in Kalahandi district. The project has drawn the anger of rights groups internationally and highlights the difficult task India faces in balancing economic development with the need to cushion hundreds of millions of poor from the fallout. Niyamgiri hills, home to 8,000-odd Dongria Kondhs, a tribal group, a few hundred Kutia Kondhs and other forest-dwellers who eke out a living cultivating pulses, paddy and collecting naturally-grown horticultural crops, is considered sacred by the indigenous tribes and others as it is the abode of Niyamraja – their presiding deity. 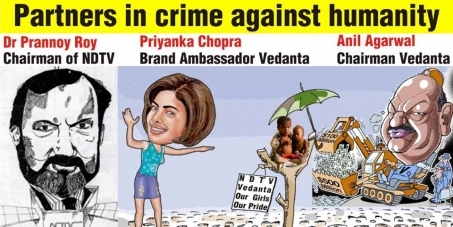 Vedanta has always duped people, last year, Creating Happiness" - a series of short films about Vedanta that aired on 37 TV channels - was an advertising campaign conceived by India's ad guru Piyush Pandey of Ogilvy & Mather. It was launched earlier this year with a technically slick film that focused on the apparent happiness of Binno, a small girl in Rajasthan, when she discovers that she can get an education from the anganwadis (child day care centres) set up by the company.